The above sketch was used as part of an experiment in determining the origin of the observation of Martian canals. Excerpts from the article are shown below. The entirety of this interesting and enlightening article can be read at Google Books (see link at the end of this post). Experiments as to the Actuality of the, “Canals” observed on Mars. 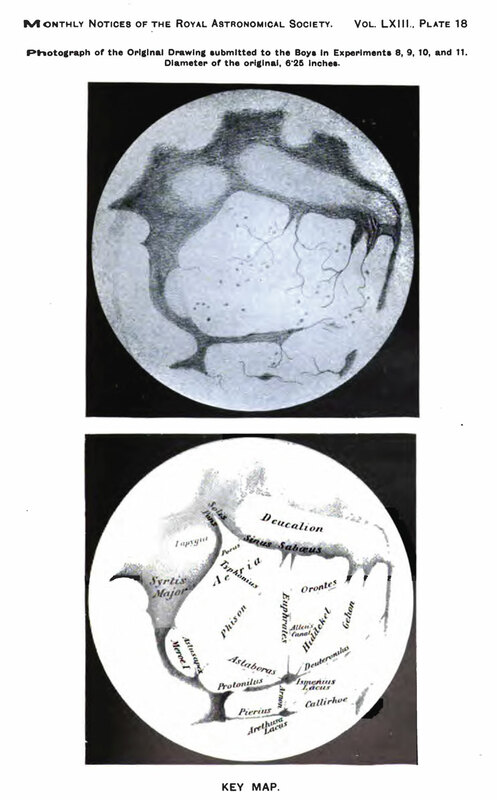 By J. E. Evans and E. Walter Maunder.The experiments described in the following paper were undertaken in order to ascertain whether the impression of a network of fine lines, such as forms what is now known as the “canal system” of Mars, could be produced upon entirely unbiassed observers without those lines having a real objective existence; and, should this prove to be the case, to find out the conditions most favourable for the creation of such an impression. The experiments were made in the following manner. A circular disc, varying according to circumstances from 3.1 to 6.3 inches in diameter, was given to a class of boys to sketch. The boys in the class were usually twenty in number, and were seated at various measured distances from the disc. These distances varied in the extreme from 15 feet up to 62 feet, but more generally from about 17 feet to 38 feet. The boys were all supplied with a piece of drawing-paper upon which a circle 3 inches in diameter had been described, and were instructed to fill in that circle with all the details which they could perceive upon the disc. No hint was given them that they ought to see lines or dots or any other form of marking ; they were simply urged to draw all that they could see and be sure of, each for himself, without noting what his neighbours were drawing…. ….The boys employed in the experiments were from the Royal Hospital School, Greenwich. Their ages ranged from twelve to fourteen for the most part; a few were either a little older or a little younger than these ages. All of them were wholly and entirely ignorant of the appearance of Mars in the telescope, and of the discussions which have taken place as to the markings on his surface. They were simply shown, what was to them, an odd-looking figure, and were told to reproduce it as well as they could. The first series of experiments was made on 1902 July 1, the last on 1903 May 22, the great majority having been made in the spring of the present year…. ….Experiments 8 and 9.—Drawing 6.25 inches based upon one by Professor Schiaparelli made 1890 May 16 (La Plancte Mars, p. 474). In this experiment none of the canals shown by Professor Schiaparelli were inserted, but a number of small irregular markings were inserted at haphazard. River-like marks were drawn flowing into Dawes’ Forked Bay and the smaller marking of the same character which Schiaparelli has represented some 30° from it at the mouth of the Phison. The region of Meroe Island was put in in half-tone…. ….It appears to us in reviewing the entire series of the experiments that it is impossible to escape the conclusion that markings having all the characteristics of the canals of Mars can be seen by perfectly unbiassed and keen-sighted observers upon objects where no marking of such a character actually exists. They are in a sense truly “seen,” not imagined, because they are the natural rendering by the eye of real markings of a different character…. ….Generally speaking, the best draughtsmen, that is to say, those who most truthfully represented the salient features of the drawing, also showed the greatest numbers of canals. It is also worth note that on the whole the agreement as to the canals was greater than the agreement as to the broad features of the original drawing…. ….Our conclusion from the entire experiment is that the canals of Mars may in some cases be, as Mr. Green suggested, the boundaries of tones or shadings, but that in the majority of cases they are simply the integration by the eye of minute details too small to be separately and distinctly defined. It would not therefore be in the least correct to say that the numerous observers who have drawn canals on Mars during the last twenty-five years have drawn what they did not see. On the contrary they have drawn, and drawn truthfully, that which they saw; yet, for all that, the canals which they have drawn have no more objective existence than those which our Greenwich boys imagined they saw on the drawings submitted to them. Published in the Monthly Notices of the Royal Astronomical Society, Vol. LXIII, 1903, Pages 488-499 available at Google Books. nice post, i knew the story but had not yet seen the actual pictures! thanks for posting them here.